Recently my two year old started using our child sized table as a combination dancing platform/ step stool, so it’s been retired to the attic. As a result we’ve been looking for booster options for our 5 and 3 years old, who used to have a table of their own to sit at and are just not comfortable sitting at our Dining Room table. Luckily for me that the minui HandySitt arrived for me to review because it’s perfect. My 5 year old loves it and has claimed it for himself. He loves sitting at the table at a height that works well for him. I love that it is so easy to use, attractive and offers so many options. This modern highchair begins with the Portable Seat, a portable booster or highchair that attaches to you existing chairs. There are detailed specs on the website to determine if it will fit your chairs. It even fits well on our very unmodern dining room chairs from the 20’s. It’s fairly simple to assemble then you just strap it onto your chair and you’re ready to go with a great booster seat. You can also buy optional cushions and a 5 point harness to add a bit more comfort or adapt the seat as a highchair for a baby 6 months and up. There is even a very nice looking optional base that will hold the portable seat or can be used on its own as an adult chair or a stepstool, so you can keep on using it after your highchair days are over. The portable seat also folds flat so that you can carry it with you to a restaurant or to a friend’s house for dinner. It’s easy enough to attach and remove from a chair that you can use it in the dining room at one meal and the kitchen at another or fold it flat for storage. With the optional StandAlone legs, the chair can also be used as child’s floor chair. We have only used it as a booster, but it can easily be adapted as a highchair for smaller children. The minui HandySitt is suitable for ages 6 months (sitting on their own) to 5 years. The portable seat and base are sold separately, as are the various accessories. Which options you will need will be determined on by your child’s age and your chairs, of course. 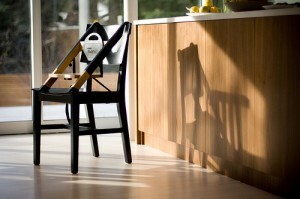 The portable seat will work with 80% of Dining Chairs in North America, so there’s a good chance it will work on yours. The base takes a bit more assembly, but together they function as a very stable seating unit and are a great option for a small child to use at the table. The HandySitt is built with FSC-certified birch and steel. It’s is available in 7 finishes, and includes a 3-yr manufacturer’s warranty on both the Seat and Chair. There is also a 45-day money back guarantee on the Portable Seat, which retails for $129.95. The base retails for $169.95. Together as the minui HandySitt High Chair, they are $299.90. This is a great option for moving your children out of traditional highchairs and up to the table.